Please remember to update the club with any changes to your address and/or phone number so we can keep our records up to date. Thank you. 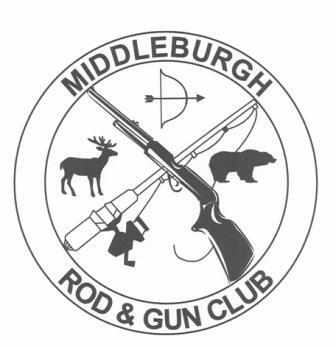 Please latch the chain when entering and leaving the Middleburg Rod and Gun Club grounds. Because it is awkward to ask a supposed fellow member for their membership card, we are taking this precaution to ensure the safety and privacy of club use by members only. The best way to ensure members only are using the ranges and facilities is to have everyone use their card key. As a fellow shooter and member at our club, I've come to notice while on the ranges, members will exchange cordial greetings, but will rarely exchange an introduction. A handshake and a name to a face can go a long way. As members of the hunting and shooting sports community, we all have different levels of knowledge and backgrounds and there is no limit as to what we have to offer each other, especially new and young shooters. So next time, share a handshake, and exchange a name the next time you are among fellow shooters. This is our heritage and a part of our life, and all will benefit from knowledge shared. Dues are payable either by mail or at our monthly meetings by May. Members not paid by the May meeting will be dropped from the club roster and must reapply to get back into the club. If you have any questions? Our bylaws are posted here for your review. Our address list for current members is getting outdated.